What a blessed and beautiful Easter week it has been. We were on the road a lot. While home, spring cleaning is happening and the difference is already wonderful. I’m finding resources I forgot that we had. I have already been making changes instead of waiting until the fall to start more new things. We all enjoyed a cartography lesson. We learned and were encouraged at our state homeschool convention last weekend. Sitting in the audience with my husband, parents, and friends while watching our girls play with the string orchestra. Again, changes are working. We have been trying new things like Classical Conversations which I like even more the more I read. Audio books are working on our road trips. A friend lent us several Lamplighter Books CDs; their lessons are presented so beautifully. Latin is still working. After my sneak peek at the The 2011-12 Primary Schoolhouse Planner, I have been planning to keep better records. It's so wonderful that your girls were able to play and that everyone could attend! I, too, am doing some spring cleaning, mostly dejunking. What a joy it is to pass things on and gain space ourselves! I'll have to look up classical conversations. Thanks for visiting Homeschool Circus. I'm now following you via GFC :-) Have a great week! 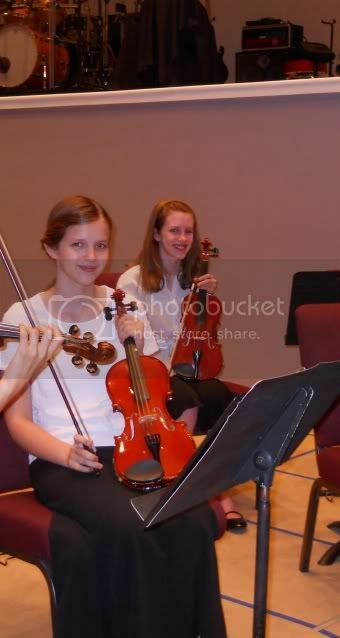 Cateetee, We realized that Heather has been playing the violin more than half of her life- for over 8 years now. Emily started with the piano and then the violin, a few years after her big sis; this was her first time ever to play with a group. Congratulations on 2 graduates! It is interesting how we keep changing. Yes- what the Lord has planned! !